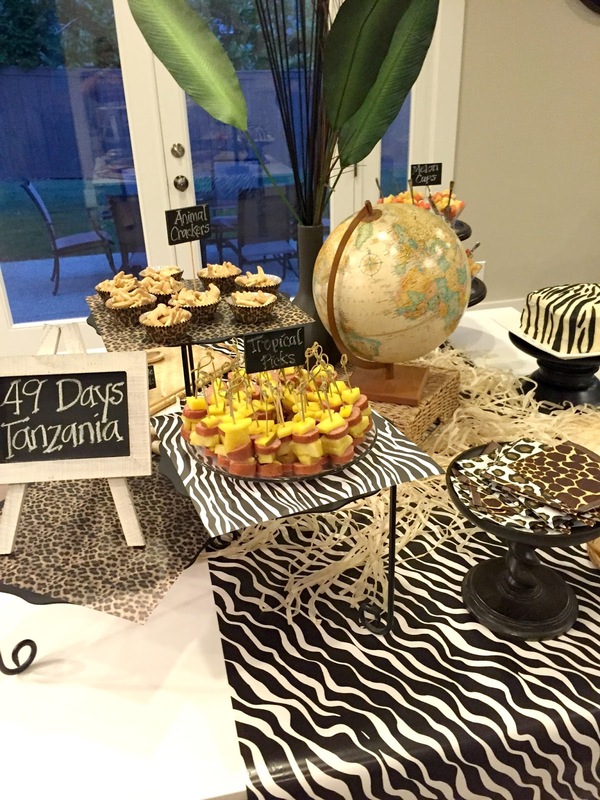 michelle paige blogs: Safari Party- We're Going to Africa! 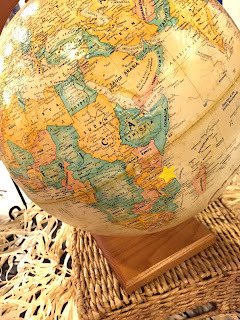 Our family is going to Africa! We're traveling to Arusha, Tanzania to visit our friends who are working with World Vision. 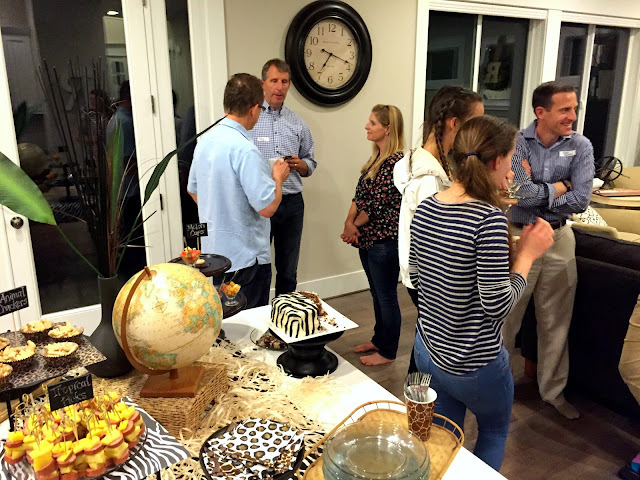 We'll be with a World Vision team of 12 other people (adults and teens) for 10 days. We're so excited! Our team wanted to have a little gathering to talk about our trip. Not only will we be seeing many World Vision projects in Tanzania, but we're going on an African safari together as well. 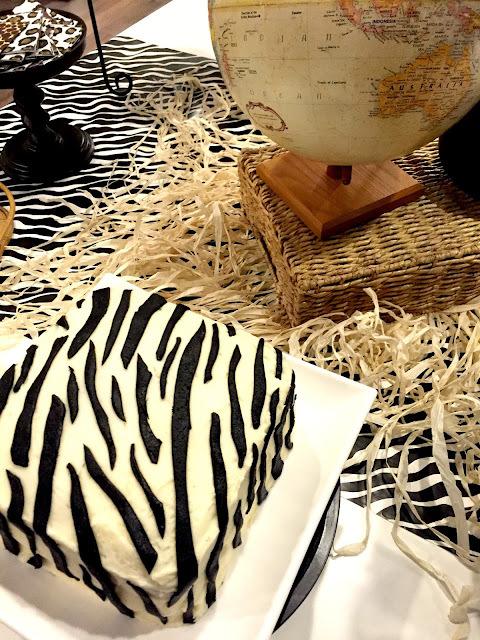 I transformed our kitchen table into a safari themed appetizer and dessert party...and it only took a few decor items. Most of these were found around my house. As a centerpiece, I laid out the raffia skirt and turned the woven basket upside down to bring some height to the globe and vase. 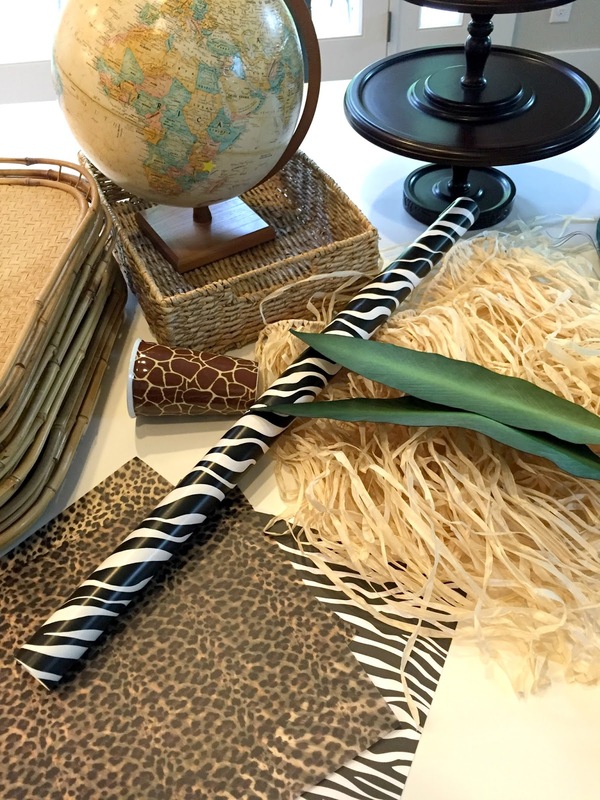 The banana leaves were placed in a dark vase behind the globe with a few dark sticks that I already had. The little chalkboard easel was found at Michaels, but this is a close match. It was a perfect way to display how many days left until we leave! My giraffe printed mug worked well for holding forks. 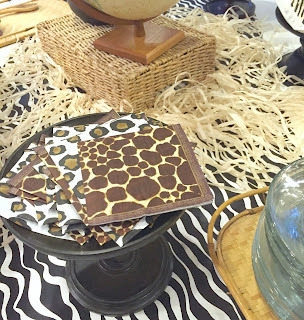 The wild animal napkins brought in more of the giraffe pattern and added the leopard/cheetah pattern to the party. On the globe, I placed a star on the country of Tanzania. It seems so far away, I can hardly believe we're going there! 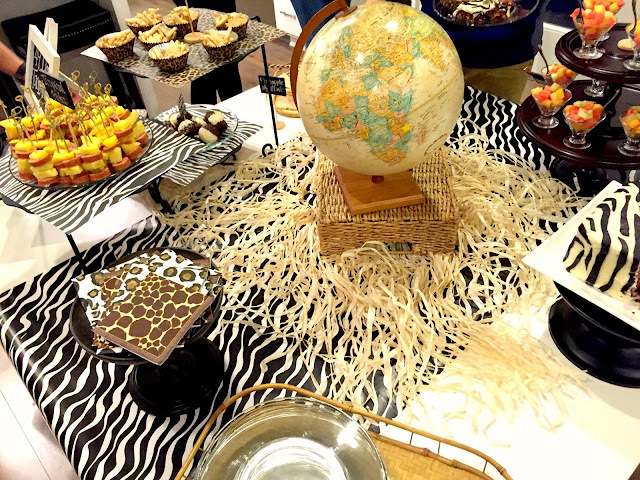 The food was placed around the table for guests to easily help themselves. And yes, the food went with our theme...you know me well. 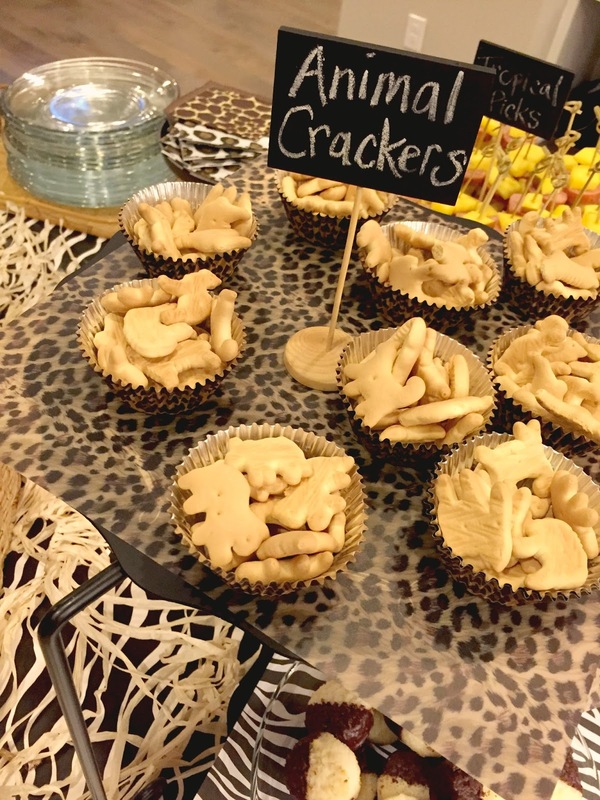 Simple animal crackers were placed in cheetah printed cupcake liners. I placed a sheet of scrapbook paper underneath and added a chalkboard label. Tropical fruit is a must at any Safari party. I chopped up cantaloupe, honeydew and watermelon into tiny squares. 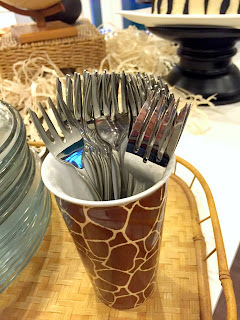 These were displayed in glass parfait cups (no longer available at Pier 1), that I use all the time. 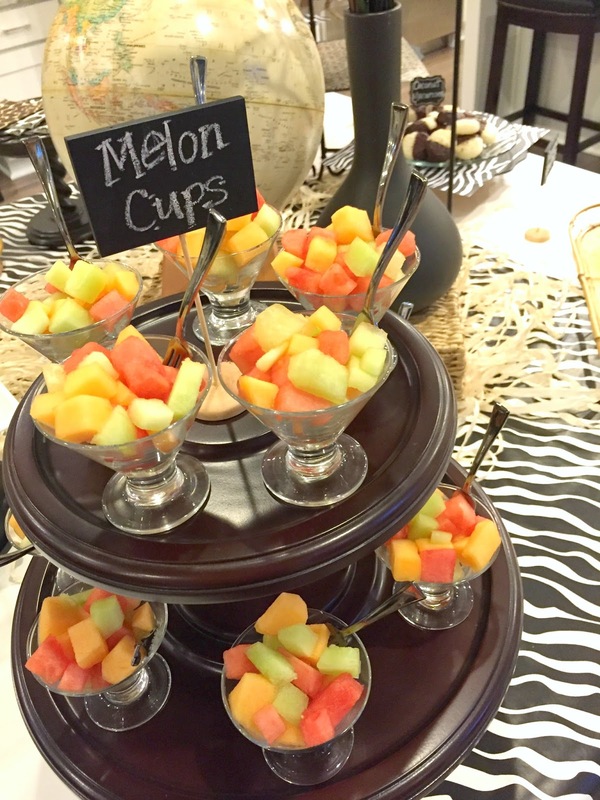 Mini forks were stuck in each one and I wrote Melon Cups on the chalkboard label. 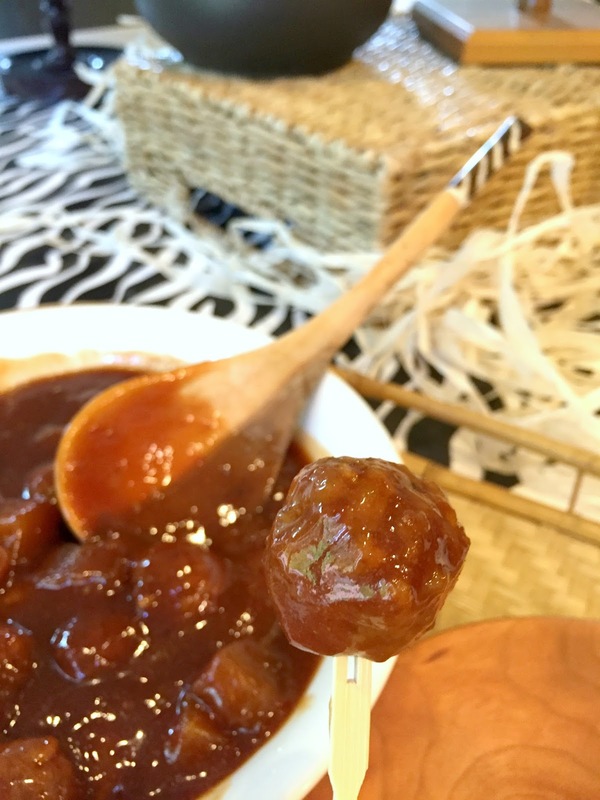 One of the biggest hits at this party was the Pineapple Meatballs. (Click here for the recipe.) Everyone loved the pineapple tangy sauce these meatballs were drenched in. Bonus: they're so easy to make! 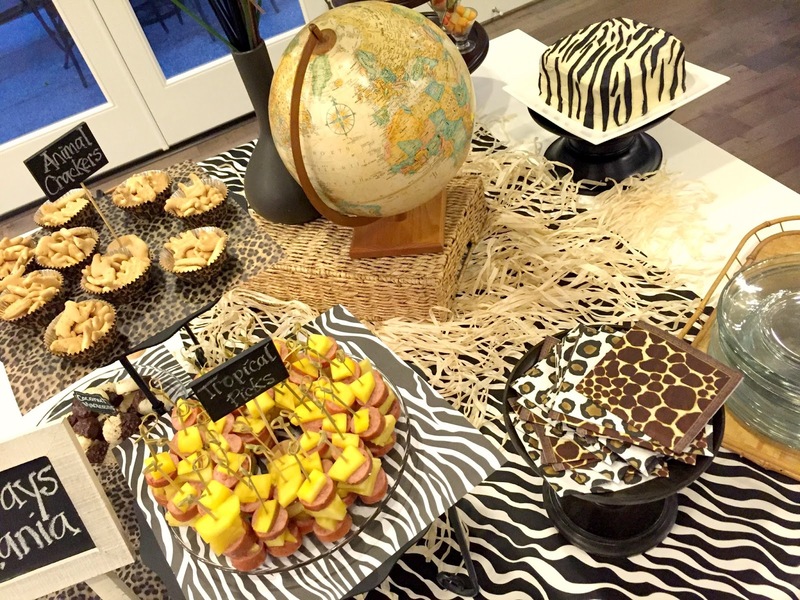 I served a few other treats, you might have seen in the pictures...tropical picks (mango, pineapple and sausage on a pick) and also coconut macaroon cookies. 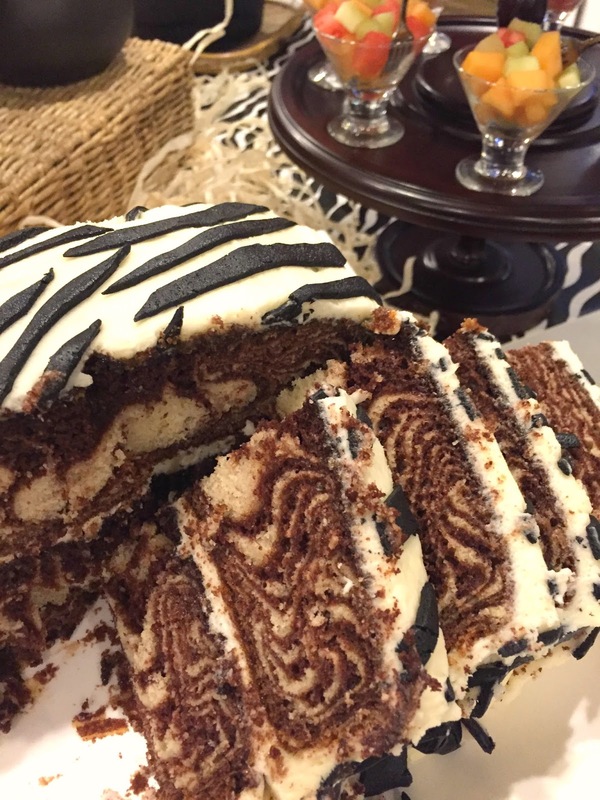 I then tried my hand at a zebra cake--another big hit of the party! 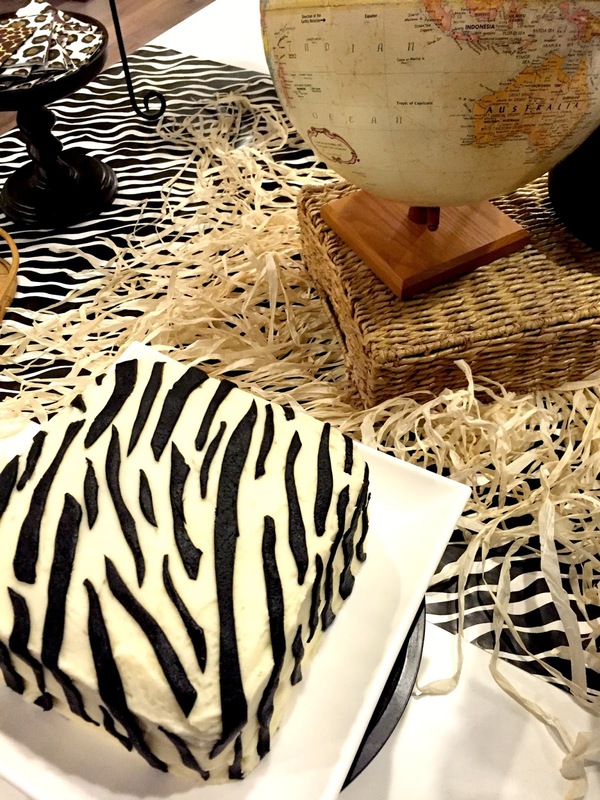 This was a square, double layer, white and chocolate cake. White buttercream frosting with black marshmallow fondant for the zebra stripes finished it off. 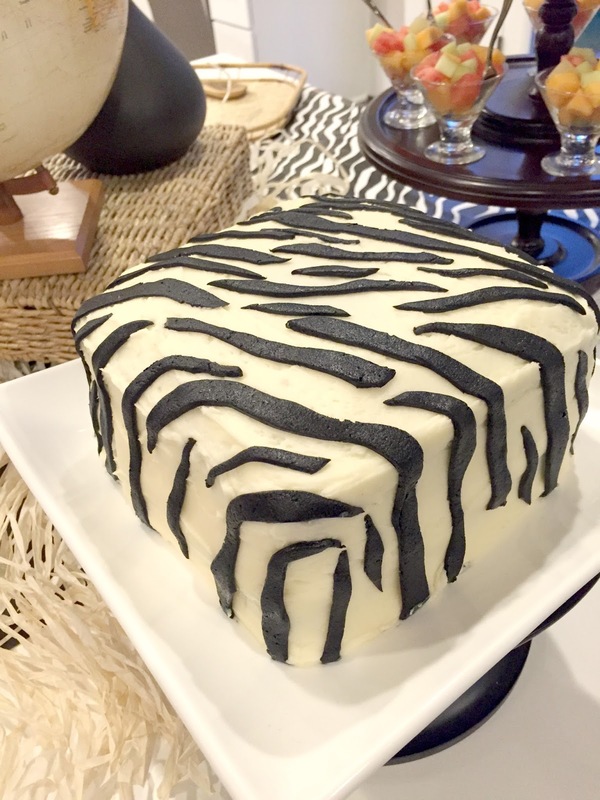 I tried to make the inside look like a zebra, but it didn't quite turn out the way I had hoped. The guests didn't mind a bit! The idea came from here. 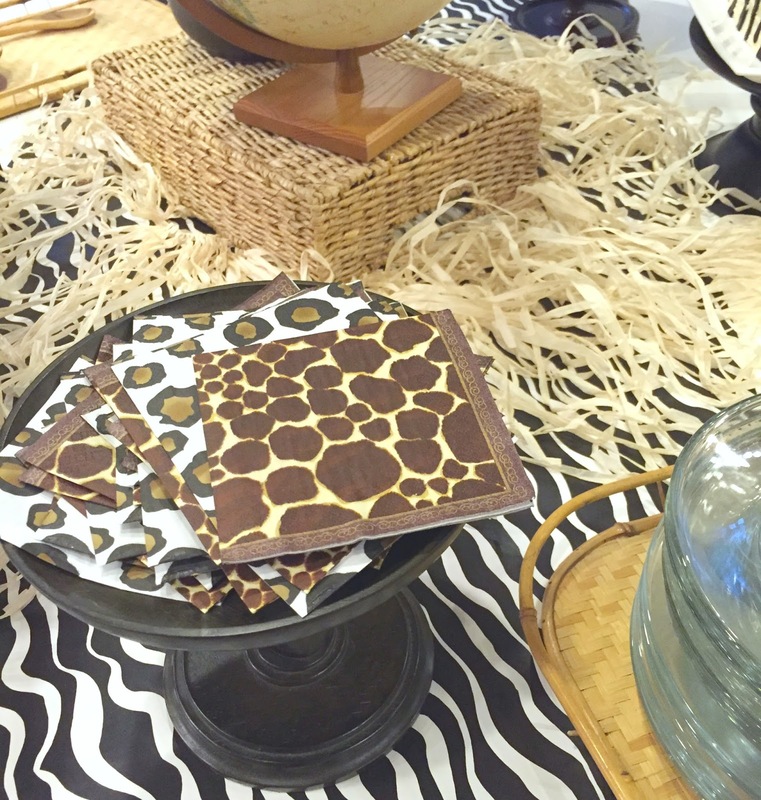 Also served was Tanzanian coffee. And that was our little Safari Party! Now, the hard part...what to pack?! 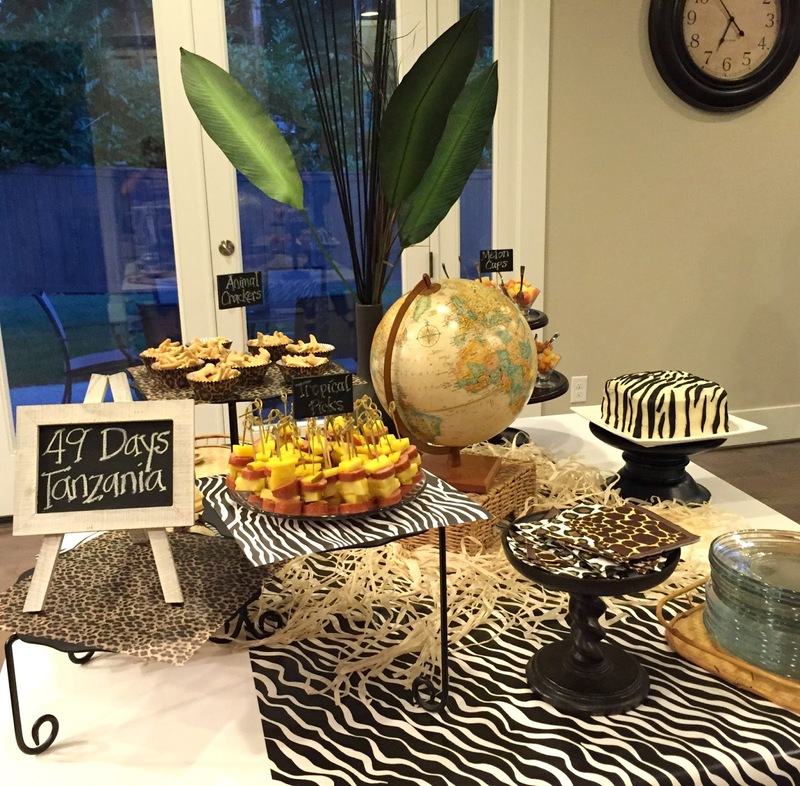 Want to see more of my themed parties? Click here.